The rain and a chill in the air have slowed things down here at the shop and the fine mechanics at Pedal Revolution have been keeping busy building up a huge assortment of custom used bikes….almost too many to post! We have a good assortment of affordable commuter bike options as well as some nicer road, touring, and city bike rebuilds. Stop in and pay us a visit to see our latest offerings. 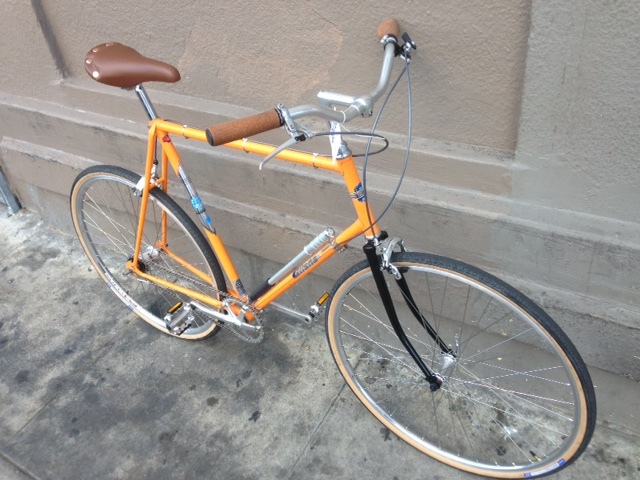 Here is a great deal of the day: A rebuilt Univega Alpina Uno set up for commuter duty with durable Continental City Ride tires. 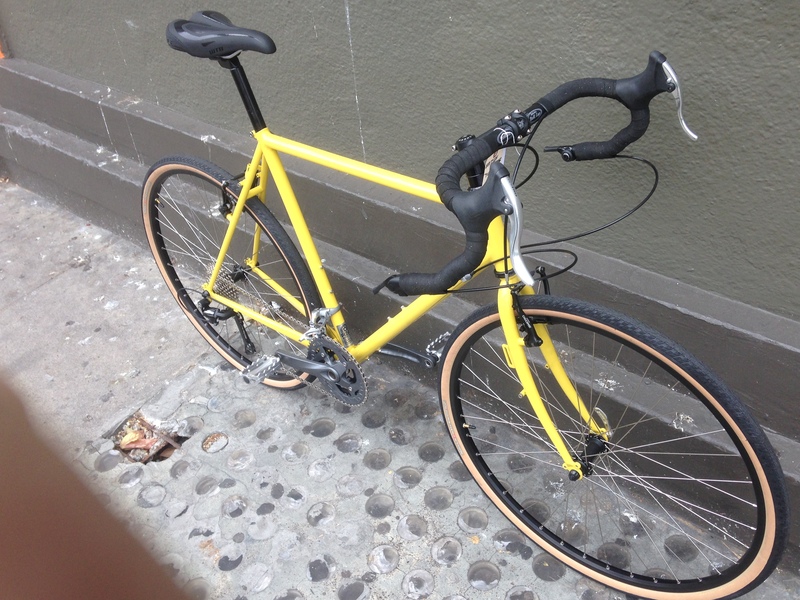 $325 for this bombproof steel framed utility bike! 19″ and an ideal fit for a rider 5’9″ – 6’1″. Surly Straggler! One of Surly’s newest models takes the much loved Cross Check platform and ramps it up with disc brakes and integrated shifters. A perfect blend of new contemporary and classic proven technology, this do-it-all bike has all the modern road and “adventure” bike features like a full SRAM Apex road component group, Hayes cable actuated disc brakes, and chubby Surly Knard 70o/650 x 41 tires. Like it’s sister bike the Cross Check, the Straggler has all the rack and fender mounts you could ever need to set it up for a wet weather commute or as a fully loaded touring rig. 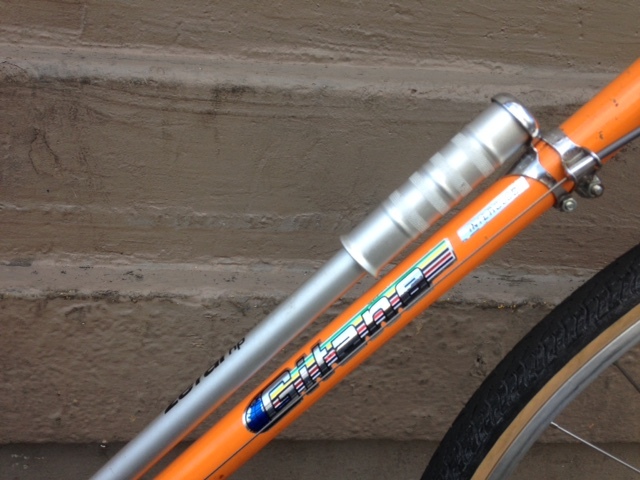 You could even slap some 28mm road slicks on it and head out on a century or a heavy road ride with the spandex crowd. 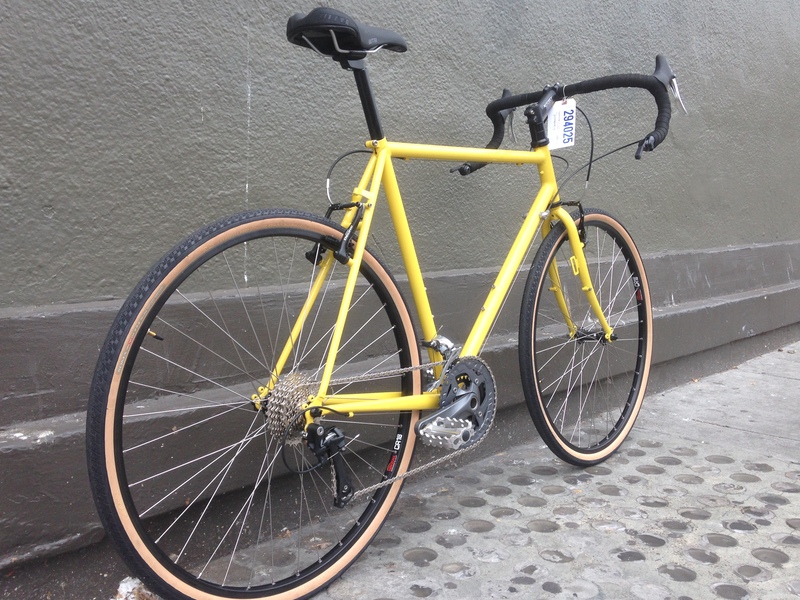 This Straggler (pictured) is the Mint colored version in a 650b wheel size. A cool new addition is the option of the 650b wheel size in the smaller frame sizes to accommodate the smaller rider and give better wheel/geometry fit and less toe overlap. The bike is also available in a Shimano 105 kit version for those Shimano-philes out there. 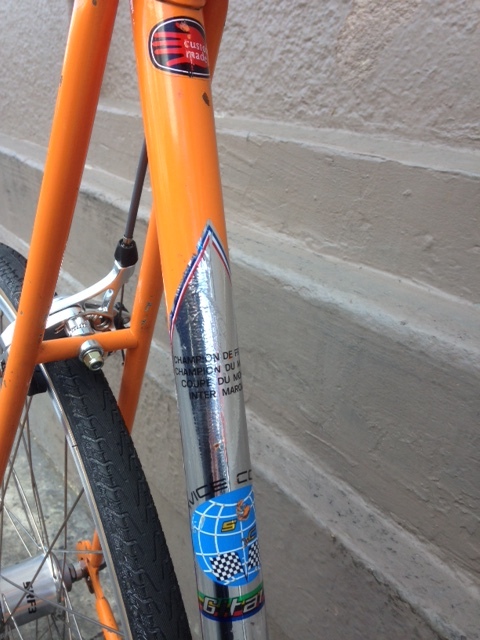 Super custom rebuild on this gem of a Raleigh frameset. A ground-up build with all parts replaced on this made in England frame including a Tange chrome fork, Sturmey Archer 3 speed internally geared wheelset, MKS touring pedals, Dual pivot brake calipers, Soma oxford bar, and leather grips and saddle. Reconfigured to give a more upright seating arrangement, this bike is a go-to city bike for daily use. Slap a basket and some fenders on it and you’ve got a reliable grocery getter/rain bike. 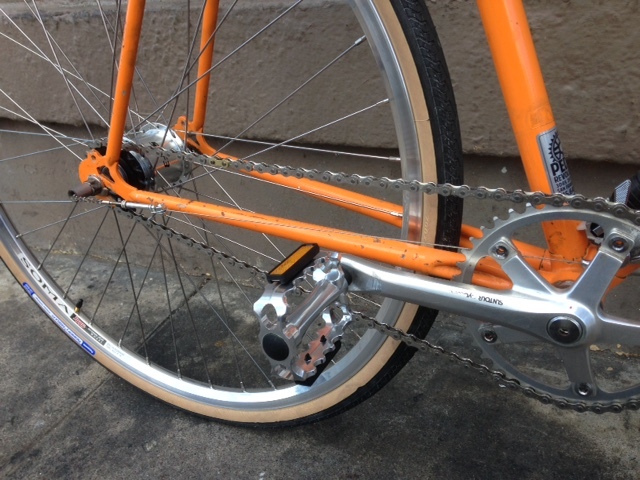 Depending on your needs, a single-speed bike can be awesome. In addition to the excellent elemental minimalist stripped down bare naked good looks, single-speeds tend to be more maintenance free than bikes with complex gear systems. 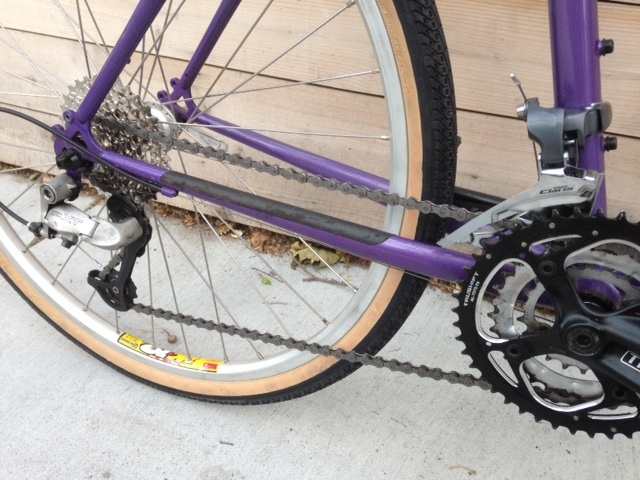 Because the drivetrains are so simple, wear and tear parts that do need to be replaced are generally less expensive (1/8″ single speed/bmx style chain for $15 vs a $50 10 speed cassette chain!!!). Simply due to having fewer parts, the bikes also trend lightweight for less dollars. As a secondary or tertiary bike, single speeds are ideal. Their lightweight and simplicity makes hauling them up and down apartment stairs and on and off public transit a breeze. Further, no need to worry about your rear derailleur getting bent out of shape when parking at a busy bike rack. This bike has super nice unique handbuilt wheels (super strong and light! ): pink IRO sealed bearing hubs and Velocity rims. The brand new wheels are 650C size (actual rim/Bead Seat Diameter 571 mm), smaller than conventional road 700c (BSD 622 mm) wheels so they are appropriately scaled to the very small frame and rider. 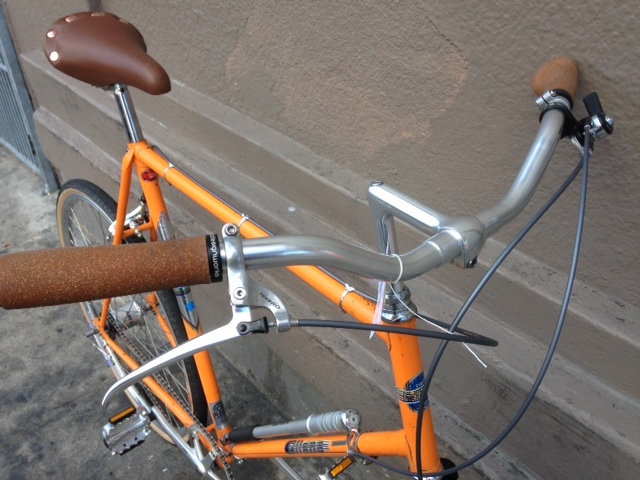 Oury grips, neo-retro Tektro brake levers, and a sweptback Velo Orange Milan handlebar for comfort and style. Specialized Hardrock commuter conversion. A total rebuild on this sweet purple fade frame. All new components in the build make for a reliable and comfortable daily rider.